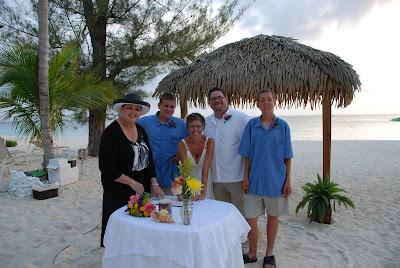 This family had been corresponding with me for at least 6 months. 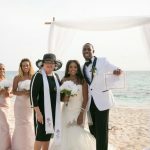 They were planning a family vacation at the Coral Stone Club on Seven Mile Beach and they wanted a wedding vow renewal for the couple's 18 wedding anniversary and a Sand Ceremony that each member of the family could participate in. 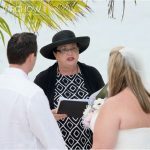 Having finalised the ceremony with them by email, I met them a week before the ceremony to go over the details. As the family was from Michigan, the colours blue and gold had to be worked in honouring the Wolverines. Go Blue! I started out by personalising their "Memory Vase" with their names, the location and date. K had very definite ideas about what she wanted. Here she is being escorted to the ceremony by her sons. 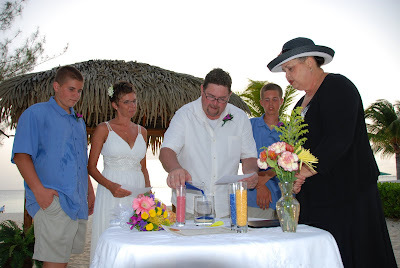 The gerbera lilies in her bouquet had a special significance for her. 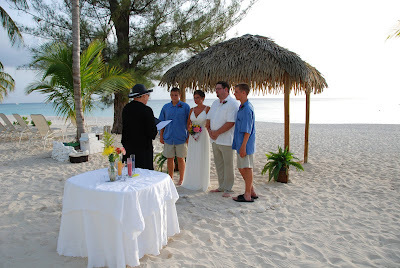 The first part of the ceremony was the Wedding Vow renewal. 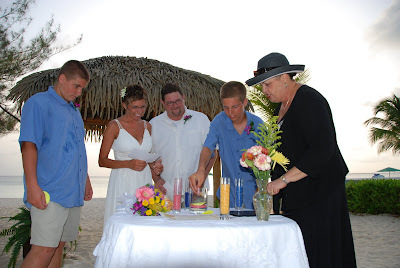 After the renewal ceremony in which the couple composed and read their own vows, we did the Unity Sand Ceremony. 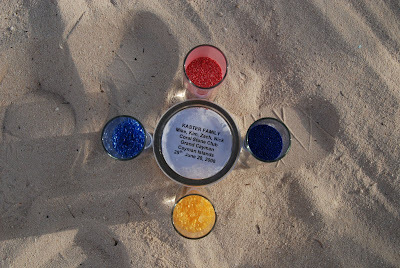 I poured a layer of sand from the beach, after which M poured his layer of royal blue sand. Both boys then poured their sand. 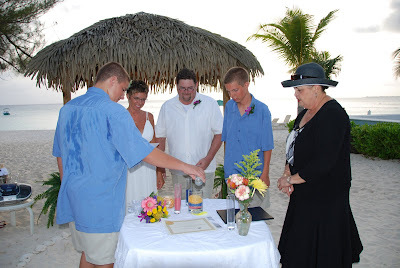 In this part of the ceremony I introduced a new feature. Both boys were briefed by me earlier and asked to wite a message for their family on a piece of paper which they placed in the vase. They could chose to let their parents know what the message said later, or not, as they chose. 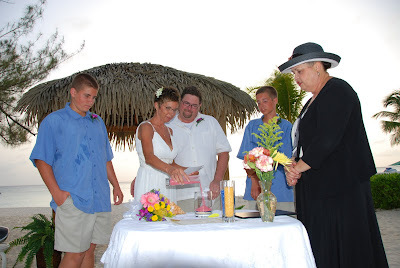 The boys also each placed a sea-shell in the vase, another reminder of this special time. For me, the messages and the shells underlined that each Memory Vase is as unique as the family which creates it. 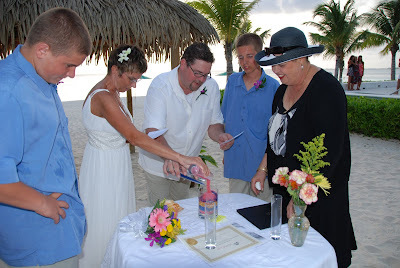 Following the boys, the parents pored their blue and pink sand and made their promises to their spouse and family in unison. 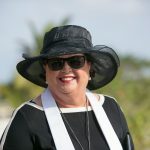 I topped off the Memory Vase with sand scooped from the beach, but I also first read, and then included in the vase the Irish Marriage Blessing (included below). 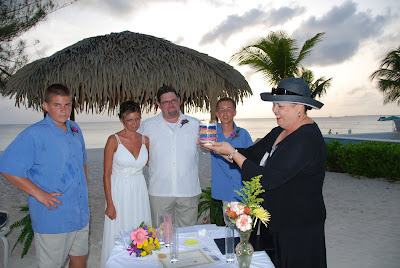 Here we are admiring the finished Memory Vase, I was very pleased with the effect of the sea-shells. Later I will provide the packaging for them to take their special Memory Vase home safely. Group shot after the signing of the Wedding Renewal Certificate. 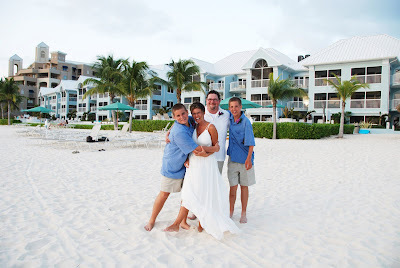 Wide angled shot of the family in front of the Coral Stone Club, yes the sand is really that white, and that clean! 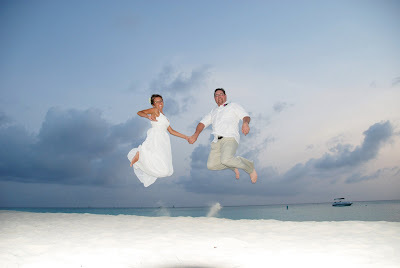 K and M have a celebratory jump, and Fevi catches it, of course! 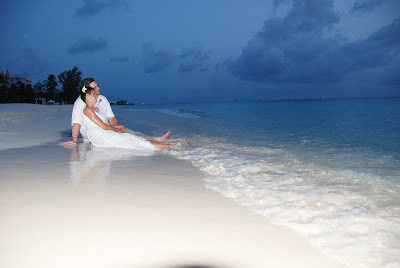 The end of a perfect day, in the surf Seven Mile Beach, Grand Cayman, Cayman Islands. 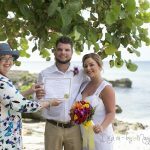 Unity Sand Ceremony written and officiated by Joy of Simply Weddings, Grand Cayman Wedding Celebrants and Planners, photography by Fevi Yu of Passion Photography, flowers by Trisha's Roses.